Funny Tech Support Shirt Warns Of Tragic Loss Of Life! Funny Tech Support Shirt design features a warning! Tech support workers rally together to stop the senseless slaughter of innocent kittens. You think it's just an innocent call to your friendly tech support office to find out why your printer isn't working but after the tech explains that the printer has to be plugged in to work, you notice a quiver in his voice as he wishes you a good day. Why the quiver? Because the tech guy knows the tragic horror of this meaningless call. He knows that somewhere another innocent kitten has perished in order for you to be enlightened. It's a sad tale but it doesn't have to be that way. Won't you help us spread the word? Won't you help us stop this senseless horror? 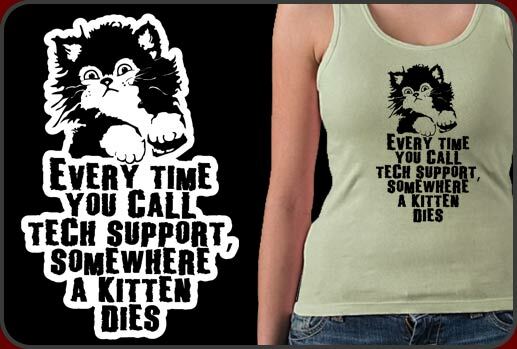 All we need to do is to educate the world that every time someone calls tech support, somewhere a kitten dies. Buy our funny tech support shirt and be the solution rather than the problem. We have tons of great merchandise featuring our funny tech support shirt design from t-shirts, sweatshirts to coffee mugs and buttons.